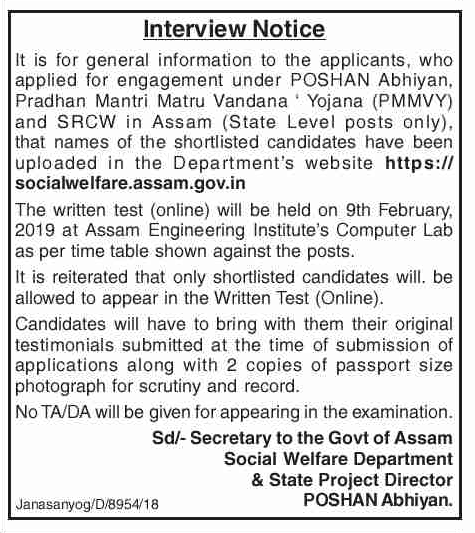 It is for general information to the applicants, who applied for engagement under POSHAN Abhiyan, Pradhan Mantri Matru Vandana Yojana (PMMVY) and SRCW in Assam (State Level posts only), that names of the shortlisted candidates have been uploaded in the Department's website https://socialwelfare.assam.gov.in . The written test (online) will be held on 9th February, 2019 at Assam Engineering Institute's Computer Lab as per time table shown against the posts. It is reiterated that only shortlisted candidates will be allowed to appear in the Written Test (Online). Candidates will have to bring with them their original testimonials submitted at the time of submission of applications along with 2 copies of passport size photograph for scrutiny and record. No TA/DA will be given for appearing in the examination.